Yesterday our retail design class headed out to the University of London to see the cell and molecular research center. I was a little confused on how this had anything to do with our project slash as many of you know I do not do well with any kind of body/science/medical topics! We arrived and got a tour of this incredibly modern building which was located in an area of older, deteriorating buildings. The concept behind the Institute was transparancy which allows scientist to feel open to communicate with other areas (labs, offices, etc). 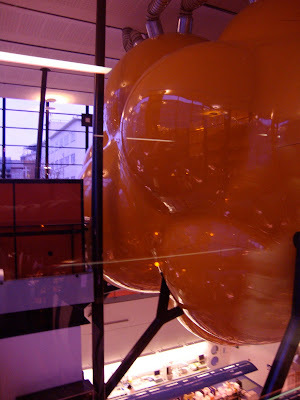 In the beginning of our tour we got to actually enter a floating cell structure that was suspended in the middle of the building above the lab below and offices were openly surrounding this huge "orange cell". Inside they had a bunch of screens and interactive games for touring groups, I tried to play a couple of them before getting lightheaded. Haha yes I really am that bad even with simple biology video games. The diversity of London design is truly amazing. Such a different experience than probably anywhere in the U.S. save for maybe NYC.